Adele - Rolling in the Deep - Crystal Clear Video? A Book on One Page invites us to overturn a conventional wisdom and to judge a book by its cover. Well, sort of. 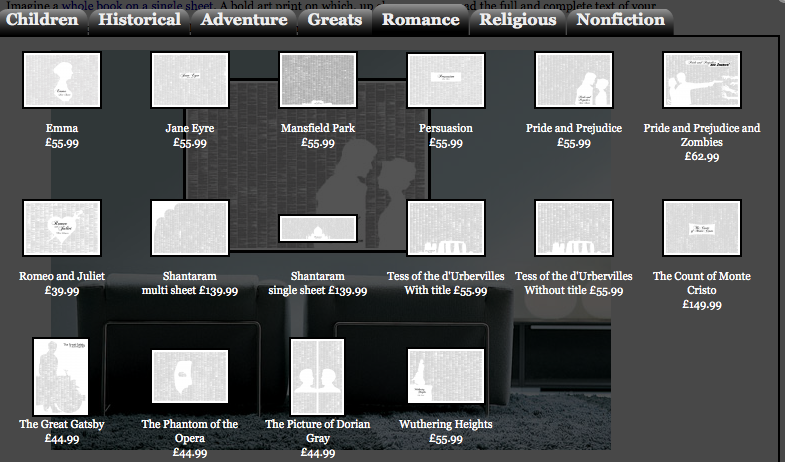 A book on One Page is an idea, concept and website courtesy of Spineless Classics. I don’t think you need me to spell out the idea – okay a cheap pun but at least I did not follow it up with a winky emoticon! They came to my attention via a Tweet back in December – okay Christmas Day – yes I was on Twitter on Christmas Day! The tweet was from Wired Magazine – Wired being a print and online magazine about technology and its place in our lives or in their own words ‘the first word on how technology is changing the world’ – yes I know we live in an always-on never-sleeping connected world but what’s the deal with always having to have the first word anyway, or indeed any word – sometimes silence is all that needs to be said – but I have digressed! The tweet as you can see was a link to a more detailed article on the Wired Website. I could in fact simply include one such image for you to understand all that needs to be understood about said A Book on One Page site and service but I like to let you know my thoughts and feelings about things too. I just cannot help myself. That is why I blog – to unburden myself on the unsuspecting blogosphere – okay moving on! In essence what this site is providing is full text novel posters. As with many ideas on the web they are copied quickly and there are other websites offering similar services. 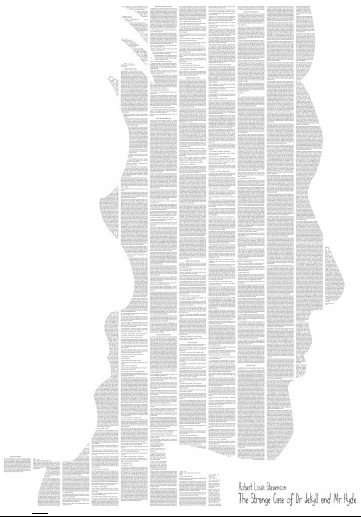 Of those that I have seen A Book on One Page produces the better art in my view – yet other sites dispense with the art altogether reproducing only the text in poster form. Pappenheim created the first Spineless Classic as a last-minute Christmas present for his mother. Having watched “architectural drawings roll off the presses at a friend’s printing company,” he figured that he could fit 100,000 words on each poster-size sheet. The reaction to the resultant poster led to the creation of the company, and posters are now available to be shipped worldwide. I noted on LinkedIn he describes himself as Owner at Spineless Publishing Limited and does not detail much about his art background. Perhaps because he has customized his CV as it were to a particular audience. He has also his own website which works as a hub and portal to his other online endeavours. However I could not find much more in the way of his artistic output. 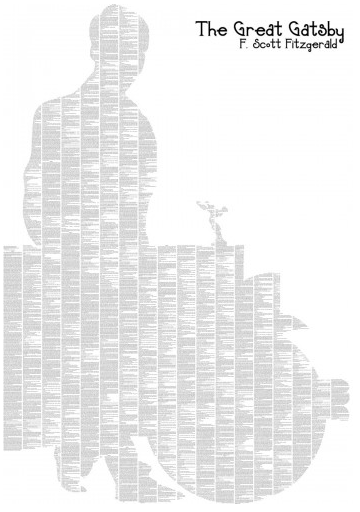 Imagine a whole book on a single sheet. 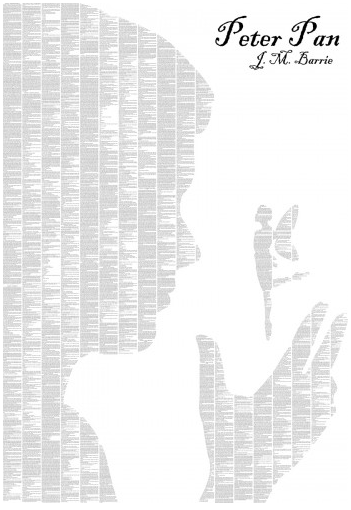 A bold art print on which, up close, you can read the full and complete text of your favourite classic work, right from “It was the best of times” to “a far, far greater thing”. Further and greater detail about them can be found on their website – on their About Page, no really! Pride and Prejudice and Zombies I’m not even going to comment on! The collection of books on show covers best-sellers and classics but is still quite a modest store. Chances are your favourite book if you wanted to buy it so framed in this format is not available. They are though adding to their library all the time, additionally we can suggest new books via their site contact form. You might consider that the books so chosen would concentrate on the slimmer volume end of the literary canon but you would be mistaken. Large volumes such as The King James Bible, War and Peace & The Wealth of Nations are among their tomes – though as you might imagine the larger the volume the higher the price tag. Choosing an image to illustrate a book is no easy task. How to alight upon just one that captures the complex narratives and ideas of a book. A case in point is Charles Darwin’s Origin of Species – there are two versions available on this site – one with a single finch and another with the Ascent of Man theme – the latter works better for me not just because a more familiar and iconic image but because it is a more striking and resonating image. The finch on the other hand feels a less compelling image and work of art. You of course may feel quite the opposite. As said it is subjective which is why the choice of image as noted is no easy task – I guess though this being a web-store more than an art-gallery it will be commercial sales that will determine which images will endure rather than the preferences of the artist himself. This Ascent of Man image is one of the poster books which actually is not A Book on One Page but A Book on Two Pages – and works well like that too – as long as you have the wall-space! The Complete Robert Burns is also available – it is illustrated by the Scottish St Andrews National Flag – he is a poet very much of the Scottish national (ist) consciousness but the flag inclusion here feels a too obvious and cheap choice out of place with his body of work – Scotland was at the heart of him but there was much more to him than that. As a piece of art too it feels tending towards opportunistic tourist gift-shop knick-knack ‘art’. Not all of these books on one page include art images at all – the Complete Works of Shakespeare for example includes the words of every one of his plays and every one of his sonnets – it is not available on one sheet either or even two rather five – should you want to purchase this bard’s work you will definitely need a large room to hang it. I include images of other Books on One Page that I think did work and would consider ponying up the readies for. If the prices are beyond your respective purses and wallets there are also versions available as jigsaws and postcard-sets. I don’t do jigsaws but understand near-completing them only to find a piece is missing is a source of quite substantial angst compounded even more then if you are wanting to finish your Complete Robert Burns jigsaw so as to then read its poetry and prose! I guess this alternative range of mediums may be extended in time – if not to the usual mugs and bookmarks then perhaps to duvet covers and rugs – even wall-paper?! These works are available to purchase online but if you prefer to see close up and smell and touch the art you are buying first they are for sale at retail locations. Currently though you would need to be resident or visiting in just three countries – the United Kingdom, Australia and South Africa. Any literary works you would like to see done this way? This entry was posted in Art, Books, Shopping and tagged A Book on One Page, Carl Pappenheim, Charles Darwin, Complete Works of Shakespeare, Dr Jekyll and Mr Hyde, Peter Pan, Pride and Prejudice, Robert Burns, Spineless Classic, The Great Gatsby, The Origin of Species, Wuthering Heights. Bookmark the permalink. I saw the article on Wired but never went to the website to see these ones on your post. They’re beautiful. Thanks for posting them. I had never heard of a book on one page. That is fantastic!!!!!!!! Thank you for liking my photos. Appreciate it! It looks like you have a lot of varied things to read here, and I will be back when I am not so sick so as to spend more time. You are welcome Terri, thanks. Oooh! My favorite is the Portrait of Dorian Gray. But would I really want someone else’s book in my face all the time? I think it would just make me feel small and vaguely guilty. How interesting. They seem quite pricey, but also about the right price for what they are. I like the Peter Pan one the best out of the ones you’ve shown. © Sam Flowers and Blog Rest and Play, [2006-19]. Unauthorized use and/or duplication of this material without express and written permission from this blog’s author and owner is strictly prohibited. Excerpts and links may be used, provided that full and clear credit is given to Sam Flowers and Blog Rest & Play with appropriate and specific direction to the original content. Bluebird Blvd. Because bluebirds are so damn happy. Supposedly.